The end of Alzheimer's disease starts here. 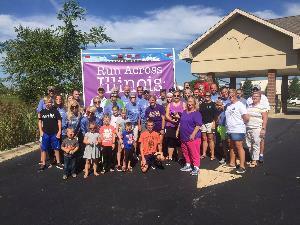 The Dryfhout family is hosting the 3rd annual Run Across Illinois - a 158 mile relay to raise funds to end Alzheimer's disease. Our mother, jan Dryfhout, has been diagnosed with the early stages of Alzheimer's - a disease that also impacted her mother, brother and many other close relatives. Our family has rasied funds for the Alzheimer's Association by running in the Bank of America Chicago Marathon the past several years and in 2015 we decided to go bigger - and Run Across Illinois was born. Together, with our runners and donors, we have fundraised almost $40,000 to advance the care, support and research efforts of the Association. The outpouring of support was truly amazing and we were touched by the number of people whose lives have been impacted by this disease. We need your support to do our part! Please make a donation to help the Alzheimer's Association advance research to discover methods of prevention, treatment and ultimately, a cure for Alzheimer’s. For the millions already affected by the disease, the Association offers care, education, support and resources in communities nationwide. Thank you in advance for your generosity – together, we will go the distance to outrace Alzheimer’s disease. I prefer to mail my donation.